What’s the Project? 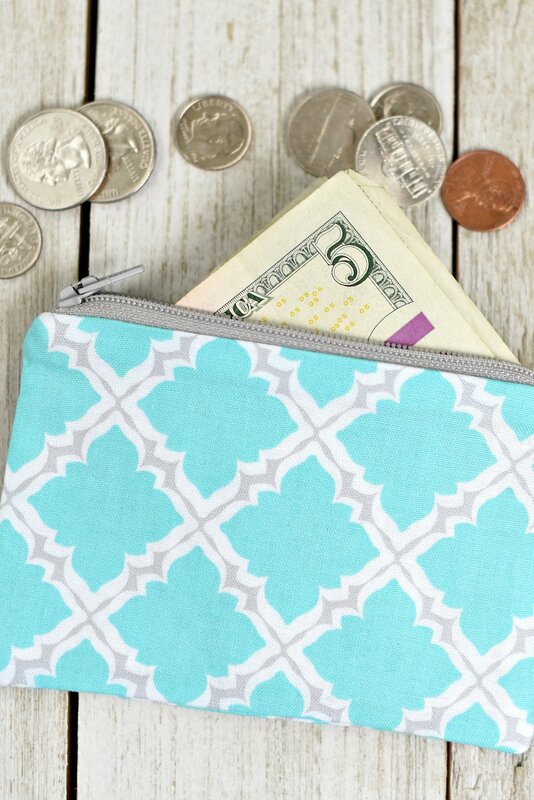 This little mini zipper pouch pattern is easy to sew and it’s a perfect little pouch to use to carry cash, coins, cards and other little things that you need. Make this in under 30 minutes. It’s so cute you can make one for everyone you know! 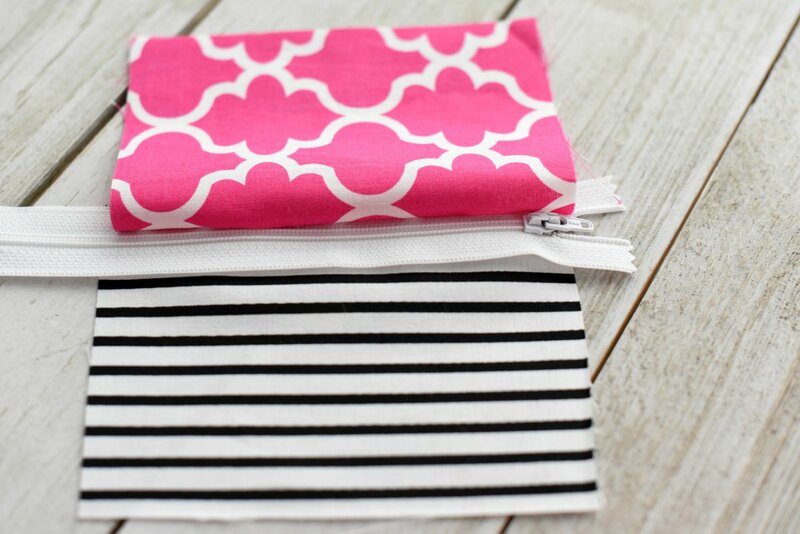 It’s been a while since I sat down at my sewing machine, but I love sewing up a simple project and this mini zipper pouch pattern couldn’t be much easier to put together! So I sat down this week and sewed up a few of these. 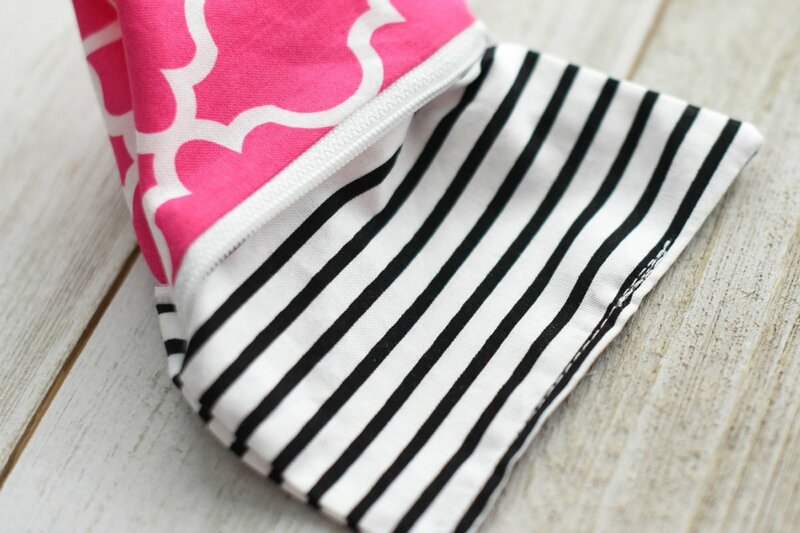 They are so easy and turn out so cute that I just want to keep sewing. 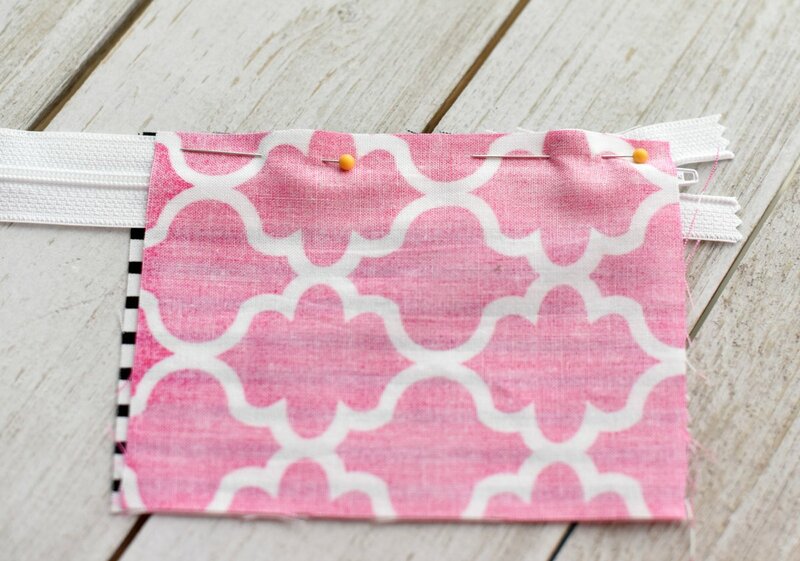 This is a perfect little sewing project to use up fabric scraps or to practice your new skills on if you are a beginner. 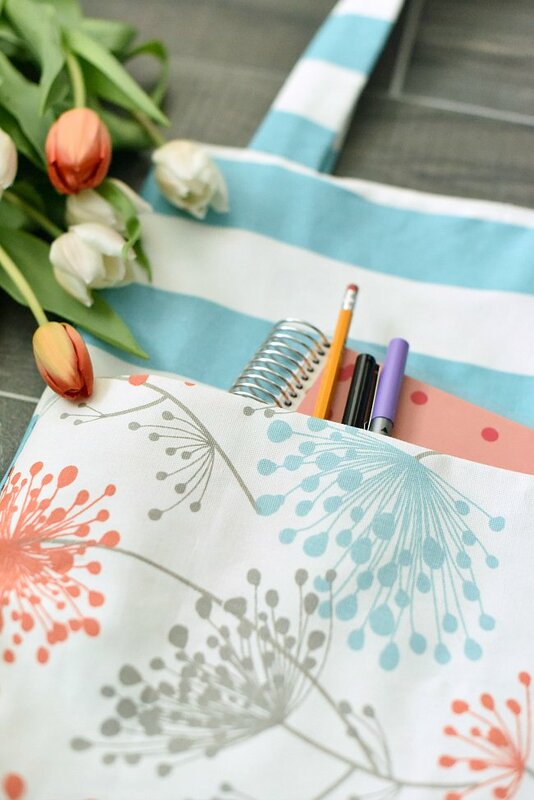 You’re going to sew a zipper on this project, but it’s doable and a great beginner sewing project to learn how to sew them. And you end up with a cute little coin purse when you are done! These little guys are perfect for carrying coins, credit cards, cash or any other little things you need to carry around with you. You know what could be really fun? 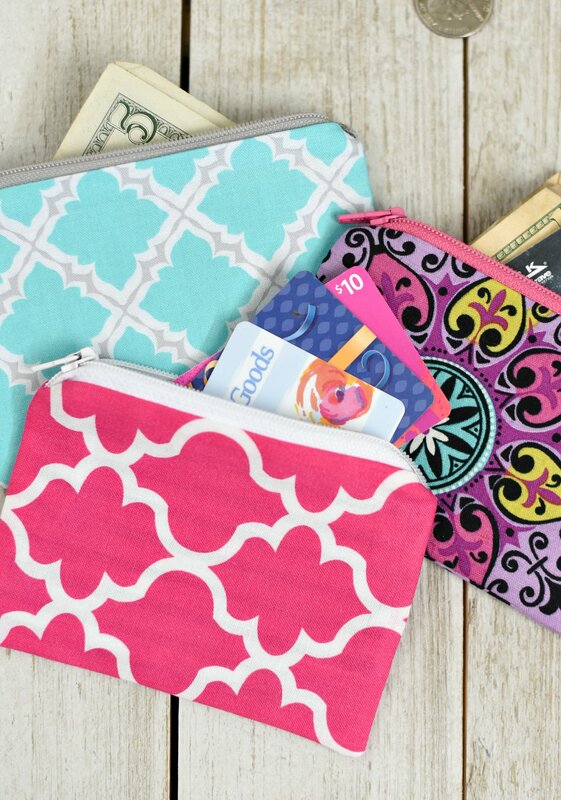 Sew one up as a gift for someone, then fill it with cash or gift cards. Perfect gift! You don’t need a lot to sew this little guy up. A few scraps of fabric and a zipper and you’re all set. But here’s your supply list. 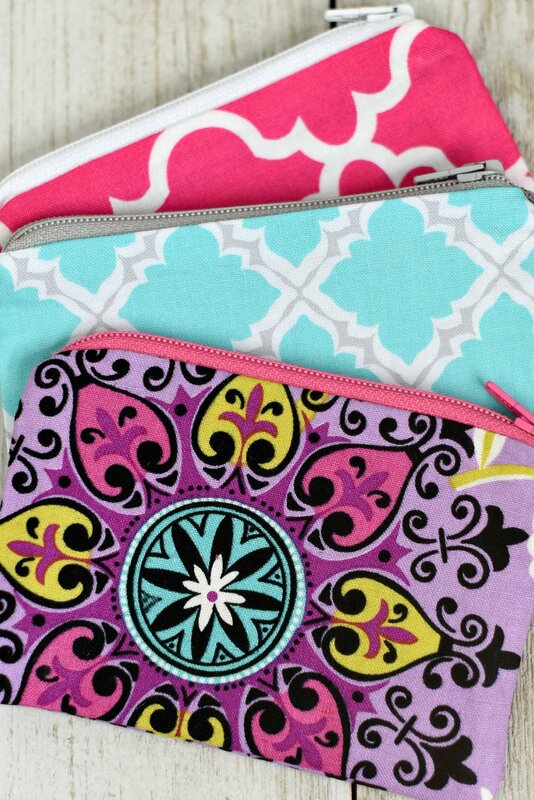 5-inch zippers You can grab them on Amazon or look for them locally. My fabric store didn’t have any shorter than 7 inches. That will work too, you’ll just cut it shorter during your sewing. 2 small pieces of fabric-one for the inside and one for the outside. Cut your fabric 5 inches wide by 3 3/4 inches tall. (This can be altered if you prefer bigger or smaller.) 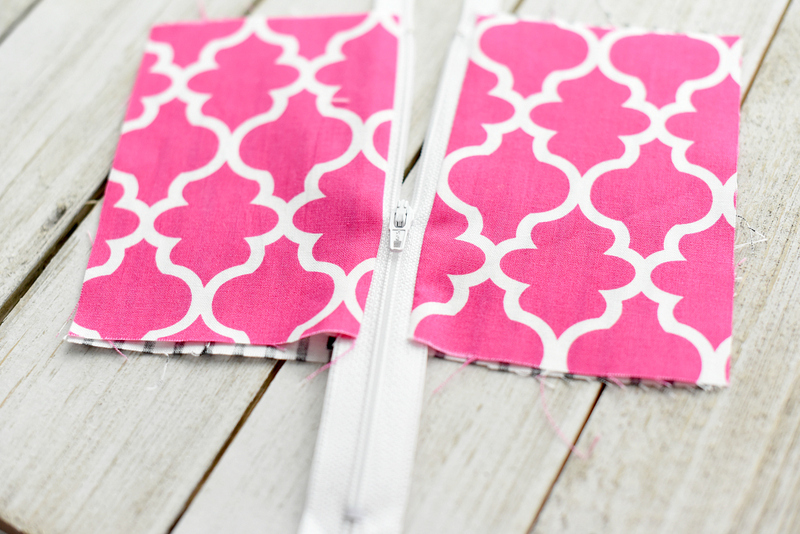 You will want to cut 2 from each fabric for a total of 4 pieces this size. Grab your zipper and one piece of your outer fabric and one piece of your inner. You will sandwich the zipper between the two pieces of fabric with right sides together along the side of the zipper as shown below. The zipper is facing up and the fabric is pinned to the top edge. 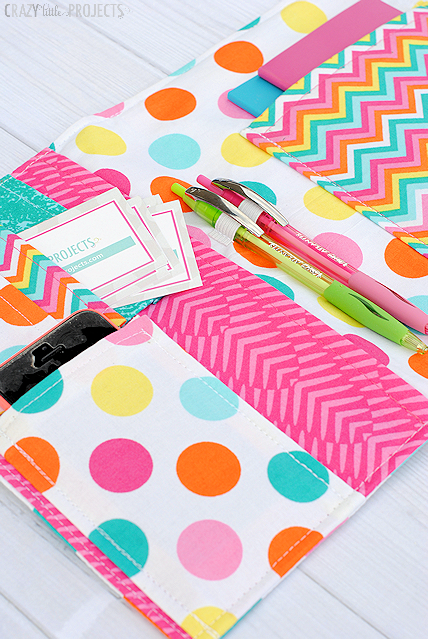 Now sew that in place using about a 3/8″ seam allowance. 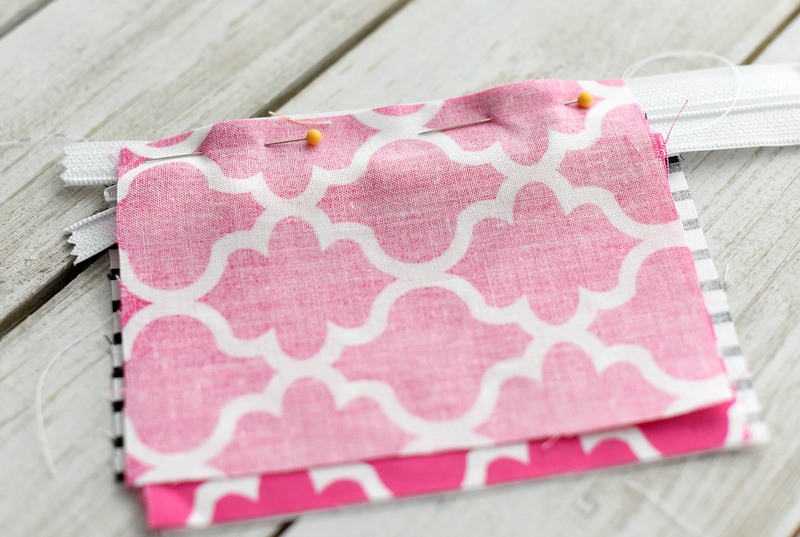 When you get to the zipper pull, stop, leave your needle in but lift your presser foot and move the zipper pull, then keep sewing. OK, now you are going to use the other two pieces of fabric and do the exact same thing to the other side of the zipper. Now lay the fabric so the zipper is centered and the fabric goes out on either side. Press it flat. Slide the zipper at least half way down (as shown above). Now bring the two pieces of outer fabric together and the two pieces of inner fabric together with right sides facing and pin. 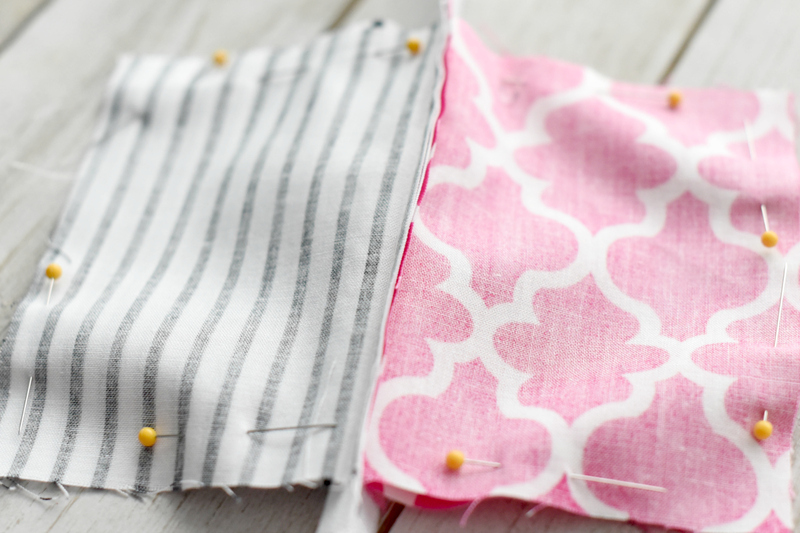 Start sewing from the bottom of your inside fabric and go all the way around. Be very careful around the zipper. Don’t let your needle hit the zipper, just go right over it carefully. Leave an opening the bottom of your inner fabric. Now if you used a long zipper, snip it off. 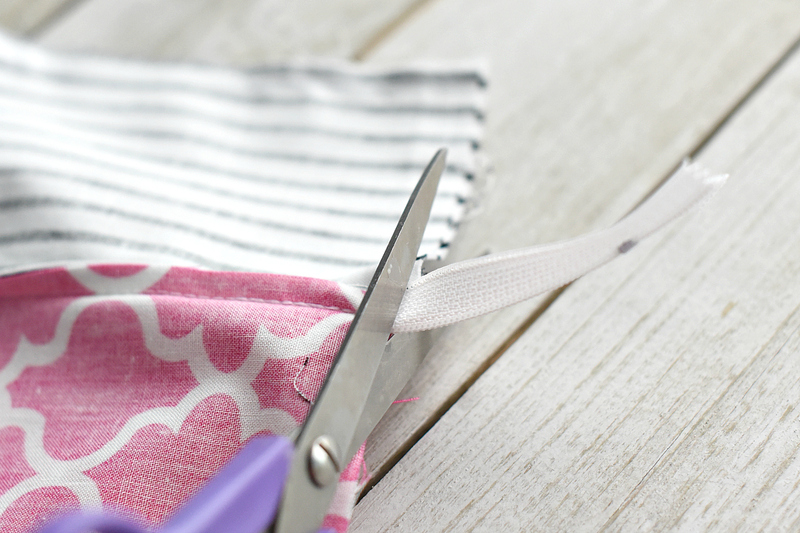 Don’t use your sewing scissors for this! Now using that opening, turn it all right side out (This is why you needed to leave the zipper part way down too. So you can pull it through.) Press the edges of the inner piece where you have an opening nice and flat and then sew the opening closed. Then push the inside down into the outside and push out all the corners with the tip of your scissors. Press everything nice and flat and you’re all done! 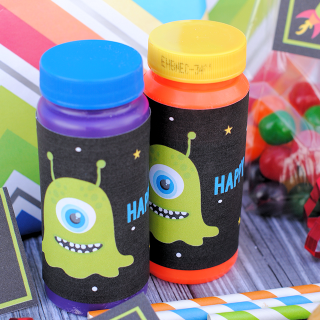 Now fill them up with something fun! I think this will be a hit in my online shop. Will definitely make some. This came just at the right time. Have just made a slightly larger one for my granddaughter. Struggled a bit with the zip and it doesn’t look quite right. Any tips please. Did you make sure it was all laying the same way? On one of the ones I made it got a little twisted when I was sewing so that one side of the zipper got sewn down one direction and the other the opposite. Made this last night. Turned out super cute! I made a small change by adding interfacing since I’m using it as a coin purse. Thanks for the tutorial!! Any tips if I am planning on sewing by hand?